Halloween Reminders: Amateur Yard Haunts & Community Haunts! It's the last week of October. Have you all been good boys and girls and enjoyed your Halloween treats all month long? We hope so, because if you are just now making plans to get to the big Halloween theme park attractions, you will be mired in lines so long that you will feel like the Flying Dutchman on his endless journey; even the smaller Halloween haunted houses will be packed this final week. Where does that leave you? With Halloween yard haunts and Halloween community haunts, of course! Numerous yard haunts and community haunts will be in operation this week. The home haunts are decorated houses, free of charge, that sometimes include walk-through mazes; the community haunts, which tend to charge a nominal fee, are put on by schools, churches, and community centers in order to provide a safe and fun Halloween experience for local families. Despite their amateur status, many of these attractions are among the most amazing Halloween events in Los Angeles, making them a great way to wrap up the October season for little or no expense. The House at Haunted Hill: an elaborately decorated yard haunt in Woodland Hills, with music, narration, and dialogue telling the back story of the ghosts haunting the premises. October 27-31. More info here. The Haunted Mine Shaft: the South Bay Maze Master takes you into the depths of doom with this 70-yard walk-through maze in Torrance. October 28-31. More info here. Reign of Terror: this excellent community haunt - one of the few Halloween attractions that effectively simulates being in a haunted house - actually started last week, but we neglected to mention it. It returns this Thursday, running October 29-31. Get info here. The Vampyre Inn's Bloody Ball: the Haunting Factory presents a new Halloween event in West Hollywood. October 29-November 1. More info here. Burbank Underground: Rotten Apple 907 presents their latest Halloween themed walk-through maze ("It all floats down here!") More info here. Enchanted Green Hallow's Eve: Star ECO Wildlife Rescue Station presents two days of creepy creatures, appropriate for kids. October 30-31. More info here. The Haunt with No Name Yet: atmospheric yard haunt in Tarzana, featuring a pumpkin patch full of intricately carved Jack O'Lanterns, plus tombstones, floating candles, ghostly figures, and more. October 30-November 1. More info here. Nightmare on Beacon Street: a community haunt in San Pedro with a maze, street fair, dancing, food, and entertainment. October 30-31. More info here. Pirates of Evergreen: a yard haunt and party in Burbank with a nautical theme. October 30-31. More info here. Revenge of the Ninja: a community haunt set in a martial arts academy haunted by angry ninja. October 30-31. More info here. Whitecliff Road Haunted Manor: this home haunt in Thousand Oaks will not have its walk-through maze this year, but there will be a decorated yard on October 30 and 31. Get info on our Yard Haunts page. Clubhouse of Horrors: a home haunt n Harbor City, set in the club house of a mobile home park. Halloween night only. Get address in the listing on our Yard Haunts page. Dr. Uphir's Sanatorium: The Haunted Garage of Long Beach presents this one-night-only Halloween haunt. Halloween night only. Get info on our Yard Haunts page. NOTE: We have not been able to confirm information for this haunt; we are waiting for an update from the proprietor, who told us weeks ago that the haunt would be back for 2009. UPDATE: We have confirmed that this haunt will be operating on Halloween night. Eternal Rest Cemetery: a yard haunt in Venice with a small walk-through described as too scary for kids. Halloween night only. More info here. Forest of Mirrors: an unusual yard haunt in Woodland Hills, using mirrors to create the illusion of an endless cemetery. Halloween night only. More info here. 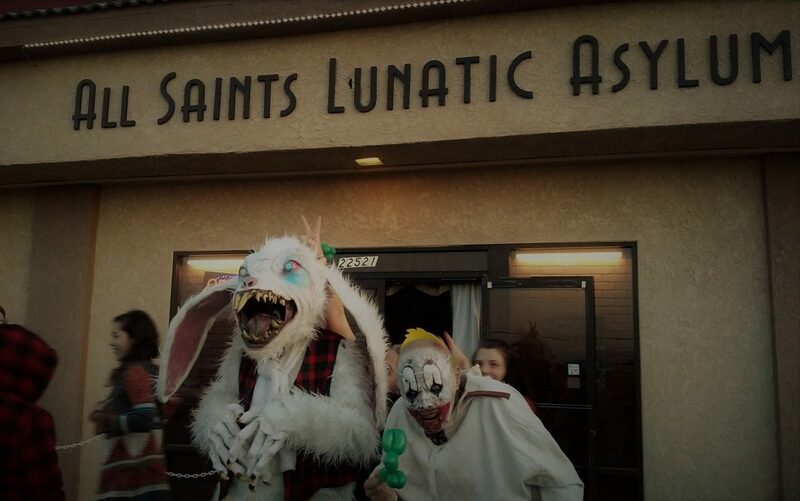 Hart Street Haunt: a Reseda yard haunt featuring mannequins and live actors in costume. Decorations are up most of the month, but the monsters haunt on Halloween night only. More info onour Yard Haunts page. The Haunted Jail: the Altadena Posse Company and the Sheriff's Support Group of Altadena present their 12th annual community haunt, again in 3D. Halloween night only. Info on our Community Haunts page. The Haunted Shack: a long-running home haunt in Torrance, featuring a walk-through maze. Halloween night only. More info here. House of Restless Spirits: a genuinely spooky home haunt in Santa Monica, one of the best. October 31-November 1. More info here. 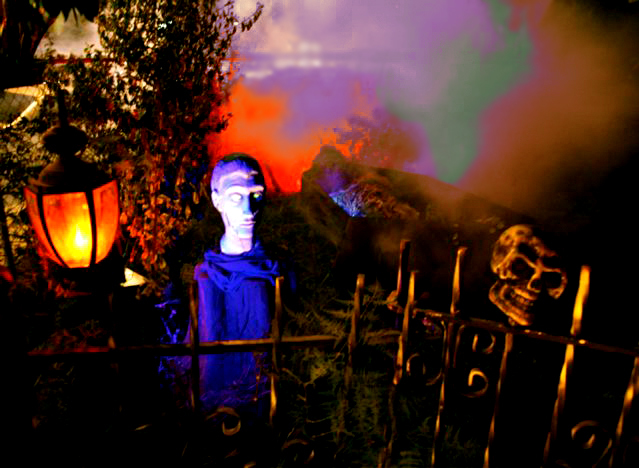 Mary & Marc Doten's Home Haunt: a decorate yard in Pasadena, listed on our Yard Haunts page. Halloween night only. Navitity Church Haunted House: this community haunt in El Monte is back for its third year, with a presentation inspired by movies like SAW. Info on our Community Haunts page. Pet Cemetery: the Gayboy Mansion presents this costume dance party in Silverlake. Halloween night only. More info here. The 13th Gate Asylum: this home haunt in Camarillo features 30 live actors in a themed haunt titled "Carn-Evil." Halloween night only (safe children's version in the late afternoon and early evening). Info on our Yard Haunts page. The Tustin Haunt: this formerly elaborate haunt is reduced to a decorated display this year, as its owner has a professional gig at Sinister Pointe in Brea. Halloween night only. Info onour Community Haunts page. UPDATE: In case you were wondering why some of your favorite haunts are not listed above, Halloween 2009 will be missing several of established names. For various reasons, this year there will be no Realm of Terror in Torrance, no Witch Castle in Studio City, no Fright Gallery in Burbank, and no Pirate Cave in Northridge. Also, Ghosts of Halloween has been added; since this post went live, we recieved confirmation from the proprietor that they would be in operation for 2009. Queen of Horror - in the Flesh! June 1, 2007 Steve Biodrowski Comments Off on Queen of Horror - in the Flesh!